Great Pacific Beach–North Mission Beach location on the corner of Mission Blvd. and Pacific Beach Drive – just a block from the ocean and Mission Bay! Enjoy beach living at its best in this new Pacific Beach vacation rental featuring: stylish, comfortable furnishings, warm beach colors, modern amenities, and plenty of windows to let in the sunshine! Entry way leads you to the spacious living area with large, comfy section couch. Prepare meals after a long day out in the sun in the beautiful kitchen with self-closing drawers, opening to the living area, stainless appliances slab granite counter tops and breakfast bar seatiung for 3. Right across from kitchen, have a sit down dinner in the cozy dining area that can sit up to 8. There is a small balcony off the living area with two patio chairs and BBQ. The main level bedroom has a cozy queen size bed, with it's own flat–screen TV, a ceiling fan, and is right across the hall from a full bathroom with atub and shower combo. On the top level, there is the Master Suite with a queen size bed, walk–in closet, ceiling fan, and an en suite bathroom with dual vanity sinks and a walk–in shower. Next you'll find the 3rd bedroom set with a bunk bed, included with trundle bed that can sleep up to 3 adults or 4 children. Adjacent to the bedroom is another full bathroom with a tub and shower combo and an office nook with a desk and lounge seating. This San Diego beach rental is in quiet complex, conveniently located to all the action in Pacific Beach. Walk out your doors and across the street to enjoy the beach, or stroll along the boardwalk, and hit up the popular restaurants, pubs, cafés, and local boutiques. Give yourself that extra spa treatment at the Catamaran Resort with a massage, facial, or lay by the pool. Great for a getaway with your group of friends or perfect for family vacations! Please note: Baggies, aluminum foil, etc. are not supplied. Everyone we spoke with was very accommodating. We appreciated the personal contact before, during and after our stay to make sure all was well with our vacation. Beautiful condo. It had everything we needed for a perfect family vacation. We would highly recommend this condo and would use Bluewater Vacation Homes again! We have now stayed in B5112 two years in a row for a girls trip!!! Please see question 15 for what we love about it ;) The only negative is that the 2 parking spots assigned with this condo has a big old concrete support right in between the 2 spots & makes either spot very difficult to fit a minivan, which we need since there is 6 of us. If the spots didnt have that, wed park in the middle of the 2 parking spots ;). But thats it! Only negative amongst all the positives!! Bluewater is in a great location and was right where we wanted to stay. Our group has been coming to PB multiple times a year for a decade and this is towards the top of our list for places weve stayed. Will definitely be booking again in the near future. The 3 bedroom condo was perfect for our group. Location was great and having full kitchen/ dining area always saves some money on the trip. Plus its a great way for our group to catch up, as we all live in different corners of the US. Great place to stay neat and clean! Location is perfect. 1 block from the beach. It is a very nice property. It is on the east side so very quite. It is extremely nice to have a bathroom for every bedroom. The beach is a block away. Many eateries and shopping in walking distance. There is a washer and dryer which allows us to wash clothes and towels when we need to. We absolutely love having 2 secure parking spaces. The property felt like a home away from home. Very friendly people with awesome communication both by email and phone, the experience exceeded my expectations. We want to book some of the other Bluewater Vacation Homes and we will book directly through next time. We loved the property and we were very impressed with how clean and nice it was. The location was perfect for the beach, shopping and restaurants! We will book this property again in the future hopefully many times! Easy to book, friendly personnel with BlueWater, checked in to see if we needed anything during our stay! Was easy to book, was very clean & well maintained! Cute decor, plenty of room! So close to beach, boardwalk, shopping & food! Only little downsize is the parking spaces- very little. Would be nice if the 2 parking spots didnt have a beam between them 2 so you can park in the middle of the 2 spaces. We had a minivan & it was very tight. Otherwise all 6 of us loved this home!! The condition and location of this property greatly improved an already amazing vacation. I will absolutely look to book this place again on my next trip to San Diego! Beautiful place that is just a block from the beach. Will probably look into staying here again in the future. "Called me personally and explained everything in detail. Very smooth process. Our place was spotless and chic. I'm already planning to be there again in March." From stay in September 2016.
Review #6248566 Great Place!! Great place to stay near Mission Beach!!! Very quiet, nice, new, and clean! Within close walking distance to beach, shops, restaurants, and grocery stores. Great parking if you have a car or easy to grab a bus or cab if you don't. The staff is very professional friendly and helpful. I would definitely recommend Bluewater for your rental needs. Just a personal FYI.....The only thing I would have done different is book an earlier flight on last day, check-out is at 10am so luggage is a problem until you go to the airport. Great vacation and super nice place to stay!!!! "Bluewater Vacation homes folks are great communicators! They sent us all necessary info before arriving, called the day after we arrived to assure the place was as we expected then called the day before we left to ask for feedback. Thank you for a great stay in a great location just a block from the beach!" From stay in November 2016. Great Place!! Guest MacyD (Oklahoma) Date of stay 05/31/13 Review Submitted 06/09/13 Great place to stay near Mission Beach!!! Very quiet, nice, new, and clean! Within close walking distance to beach, shops, restaurants, and grocery stores. Great parking if you have a car or easy to grab a bus or cab if you don't. The staff is very professional friendly and helpful. I would definitely recommend Bluewater for your rental needs. Just a personal FYI.....The only thing I would have done different is book an earlier flight on last day, check-out is at 10am so luggage is a problem until you go to the airport. Great vacation and super nice place to stay!!!! Recommended for: Families with young children, families with teenagers, tourists without a car, girls getaway. Reviewer Location: Las Vegas, NV - Date of Arrival: September 4, 2015 - Review#:12985701 - "Gem by the Beach" Review Rating: 5 out of 5 - "This was my first experience with a vacation home & I can honestly say, we will be staying here again! This beautiful home was in the perfect spot for everything in Pacific & Mission Beach areas. It is centrally located within walking distance of everything. The home was perfectly sized for two adults & 5 well-behaved children. We had plenty of room without bumping into each other at all. We had everything all thoughtfully there at our arrival. Parking was very convenient as well. It was a beautiful getaway all around!" Reviewer Location: London, ON - Date of Arrival: February 6, 2016 - Review Rating: 5 out of 5 stars - "Excellent Service, Great Property" - Review: "The service we received from booking this property to checking out was great. It was super easy to book the property. The day before we arrived I received a phone call to see if I had any questions, then on check in day I got an email and another phone call to make sure everything was fine with the property and we were able to access it. On the day we checked out I got another another phone call to ensure everything was fine. The house was very clean and the TV and internet worked fine. There was a binder in the kitchen that had everything we needed to know it in which was great. The location of the property was right on a main street near many places to eat, a grocery store, Starbucks and only one block from the beach! 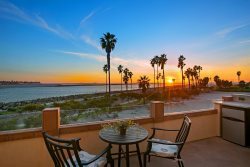 :) "
Reviewer location: Switzerland Date of arrival July 18, 2015 Review #12474536 Fantastic stay in San Diego Review rating 5 out of 5 San Diego is anyhow a exciting location and the apartment was an excellent choice to feel comfortable during the whole 14 days. Enough room, well equipped (the laundry machine helped to keep clean beach towels), nice furniture and only a few yards to the beach as a few mentioned advantages. Nice restaurants in the area, a good super market and lots of shopping opportunities completed the vacation. We will certainly repeat this in a few years.